at 6.30 p.m. for 6.45 p.m.
Click link right for a scalable location map centered on The Redgarth. The Rotary Club of Oldmeldrum also have a Facebook page and a Twitter page @MeldrumRotary. 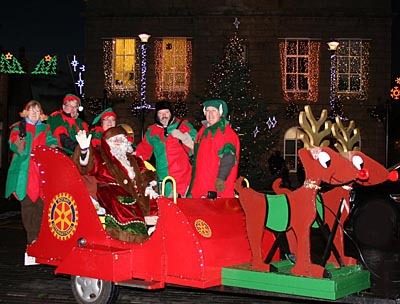 Santa and his Sleigh, with full complement of Elves were again out visiting Oldmeldrum and the surrounding villages in the weeks running up to Christmas 2018. We were also able to make a couple of appearances at the new Co-op Store in Oldmeldrum on Saturdays 8 and 15 December. The weather this year was quite kind to us, no ice or snow, though we did have some drizzle on some of the nights we were out. Due to the generousity of the children and adults in Oldmeldrum, Tarves, Rothienorman,Methlick, Daviot and Newmachar, this year we were able to collect a total fo just over £3800. The Rotary Club of Oldmeldrum gives its grateful thanks to everyone who supported its pre-Christmas Santa Sleigh collections. The club would like to thank all the volunteers who took part, including Santa himself. However, we'd particularly like to thank everyone who made a donation, no matter how big or small. This year, even with the economic downturn, people have still given very generously to support our activities. The majority of the money raised will go to providing funds for support of local community activities,such as funding local pupils to attend RYLA (Rotary Youth Leadership Award) and the European parliament, and providing financial assistance to local individuals and groups. Money will go towards projects which bring clean water and shelter to communities following disasters; towards projects to promote literacy and of course, towards the Rotary campaign to eradicate polio worldwide. The generosity of folk in the area has once again been magnificent, and people can know that the monies raised will be used to make a big difference to the lives of people around the world less fortunate than ourselves. Welcome to the Rotary Club of Oldmeldrum website, and here is a bit about us. Oldmeldrum Rotary Club was formed in 1999 and is a lively, active, forward thinking club with an enthusiastic membership of male and female members drawn from the business and professional communities of Oldmeldrum and surrounding areas. Oldmeldrum has grown from being primarily a centre for the agricultural industry to a busy small friendly town with increasing links to the oil industry of Aberdeen. In order to encourage and foster the Rotary ideal of service in our local community and beyond, the Club undertakes a variety of service responses in vocation, community and international activities for the promotion of goodwill and understanding. As well as the regular Monday night meetings in the Redgarth, the Club regularly organises a number of extra mural activities and social events, e.g. the Haddo Easter Egg Hunt and visiting the local communities with our Santa Sleigh. It has developed close links with the local schools, and Club members actively contribute to the improvement of community facilities. The Club also raises significant sums of money for local and international charities. For further details of these activities, click on the different links at left. We are a friendly welcoming Club. If you want to know more about us, or would like to attend a meeting, please contact the Secretary, or one of the Club members.